Here I looked at five laser cut pen kits from Kallenshaan Woods: The Killer Whale, the Polar Bear, the Canoeing Bear, the Frog Pond, and the Golfer kits. Each laser cut blank comes neatly packed in a plastic container with comprehensive instructions specific to the kit. I found the instructions easy to follow and accurate, which is good since the method of assembly for each kit is slightly different. A Sierra pen kit is required to make up the blanks into pens, in addition to the parts provided. The laser cut components were very accurately manufactured and there was no problem with ill-fitting parts. However, some of the components are very tiny and therefore great care is needed during the assembly process as the small parts could be easily lost. I would strongly recommend working in a clear area on a plain background â€“ these are not kits to be assembled on an untidy workbench. If you have big fingers then you will find the smaller components quite fiddly to fit, so fine nosed pliers or tweezers are needed. The fine fit of the components means that, once assembled, there are no unsightly gaps between the components. Also, once all the joints are flooded with Cyanoacrylate adhesive, the whole assembly becomes quite robust. Most of the kits are assembled off the brass tube, which is glued in afterwards, and I found it was necessary to follow the guidance in the instructions to smooth out the inside of the blank. For this I used abrasive paper wrapped around a dowel or pencil. 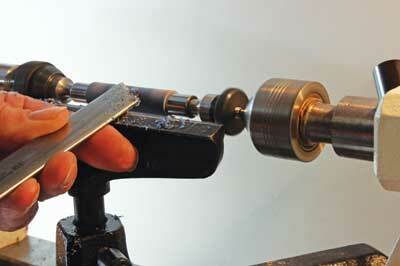 Turning was relatively easy but you need to use sharp tools to be sure that you will not dislodge any of the pieces. I used a skew chisel, but a spindle roughing gouge or Spindlemaster could be used with care. The colour of the components remains consistent so the image remains clear as the blank is turned to shape. Sanding did not cause any merging or staining between the colours, even without the use of sanding sealer. The blanks also sanded to a very fine finish. I finished mine with Cyanoacrylate and then buffed them with white diamond compound to achieve a glass-like shine. I found these kits to be of excellent quality and not difficult to work with provided care is taken with the smaller components. 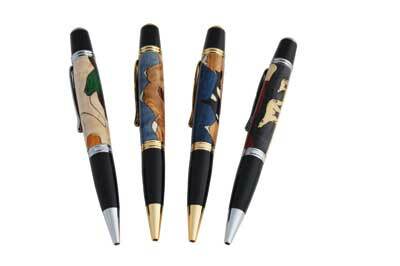 They are quite expensive and would push the price of a finished pen quite high if you are making them for sale, but they would be an excellent choice for the turner who wishes to make themed gifts. The quality of these kits is excellent. But, as Walter points out, you need to be working in a tidy area to make sure precious bits are not lost during assembly. The laser cutting is brilliant and leaves a tight join between the parts. The colours of the parts are vibrant, too. Very nice kits indeed.